The Future of CicLAvia: 4 to 6 Events in 2011? 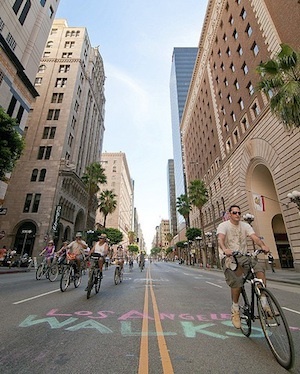 Last week&apos;s car free party on 7.5 miles of Los Angeles streets — aka CicLAvia! — was such a success that there are talks of bringing it back at the City Council level — after all, the route went through five political city districts — and within the nonprofit that organized the event. "It’s all somewhat up in the air at this time - subject to change - but we decided to plan on 4-6 CicLAvia events in 2011! The first 2011 CicLAvia will tentatively be in April, along the central Los Angeles route, same as (or similar to - possibly expanded) the 10-10-10 route," announced CicLAvia organizers last Friday. "From there we hope to move around to different parts of the city (possibly collaborating with other adjacent cities) and return to the central 10-10-10 route again once or twice later in the year." City Council President Eric Garcetti called the event "an absolute game changer" on Friday when honoring the organizers. "We saw overnight what was possible, not by building a $500 million new park or by having to change a lot of things, but by simply closing down streets and saying &apos;Hey, we can all own these streets, but we don&apos;t have to do it in our cars,&apos;" he said, calling the route a 7.5 mile linear park. "One thing I saw the most was people smiling, looking at buildings and going, &apos;Oh my god, I can&apos;t believe this is L.A.&apos; En masse, Angelenos left their cars behind."